I keep trying to put words to my feelings: "this is what I am feeling and why," like putting lyrics to music. But it just doesn't always work that way. If you try to think about how to ride a bicycle, you will probably fall. If you try to figure out the trajectory of a ball to catch it, you will probably miss. I know that whenever I start to analyze what I'm doing when I am parallel parking I screw it up, but if I just do it intuitively I am fine. Words, thoughts, as much as I love them, they just don't always belong. Sometimes you just have to feel. Sometimes you just have to cry and not understand the exact nature of grief. I know I am stressed out over this bone that could be Michaela's. The testing is taking a long time, but honestly that is not what is stressing me out. In fact, I'm almost glad for the delays, because I dread the results. It will be far less disruptive to my life if it turns out that this bone does not belong to Michaela, and yet that will also mean having to pick up that lead balloon and start trudging down that road of hope again. And I do feel so, so tired. I'm exhausted trying to find Michaela, frustrated over the lack of resources and help, and over not knowing which of the many roads to concentrate on going down. But if the bone turns out to be Michaela, well, that means going to a place I have never been. I don't know what that place will hold, but when I think about it ... well, it feels kind of like a nuclear explosion in my life. It isn't just confronting the grief. There are many things in that place that just terrify me. How will I live? I know that Hurricane Sandy is also really getting to me. It's reminds me of the uncertainty in life, and the possibility of total devastation that can lie unexpectedly in wait around any corner. And that is scary, unsettling. "I have so many feels," as my daughter would say. I love this phrase. It seems so appropriate, because all those things inside me certainly feel more like verbs than nouns. I have heard it said that mechanical breakdowns in your environment often reflect what is going on in your psyche. Well, my washer broke last week. It just never stopped filling, and water overflowed all over the dining room, dripped down into the basement and the garage. Water is a symbol of emotions, so it seemed appropriate. 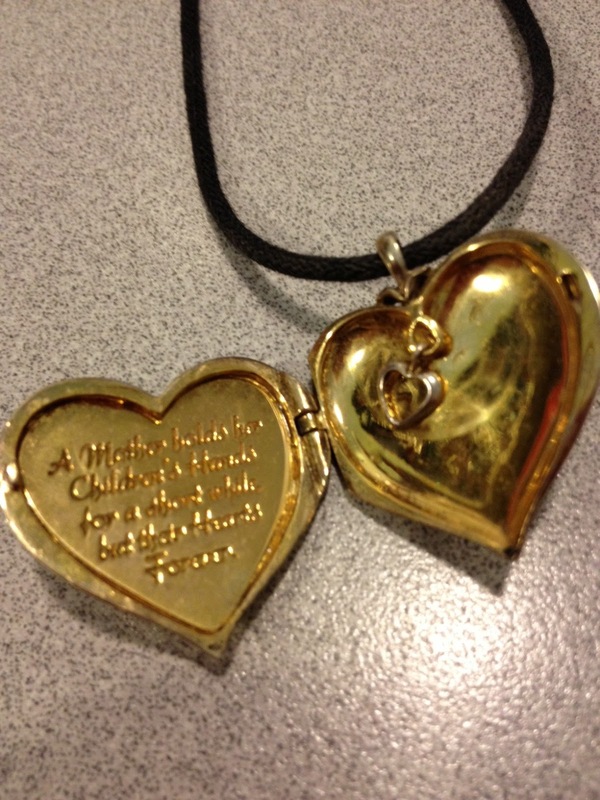 What really seemed appropriate, though, was that my locket broke, wouldn't stay shut. I couldn't close my heart. One more day and then guess what. It's November. The month of the Mourning Moon according to Native American Traditions. What will it hold? Well, my youngest daughter is performing in the main stage production at her college, in the female lead role, and I'm really looking forward to that. Lots of other plays in November also. Her boyfriend is in a play this weekend, and the dramatic arts academy that I am involved with has two groups doing performances in November and one in December. My son's band has a final playoff in a Battle of the Bands contest, and that's exciting. I'm looking forward to Christmas, because I am looking forward to going to see Les Miserables if I can talk someone into going to the movies with me on Christmas Day! Minute by minute, one step at a time. That's how we do it. Pema Chodron talks about the impermanence of fear, but I don't really know what she means. I do know that there is always something good in life today, always something to look forward to in the future. I have read your blog and facebook posts for a long time. You are such an amazing woman and your children have an incredible mother. I cannot even fathom your emotions and the ups and downs you have been through over the last 24 years. 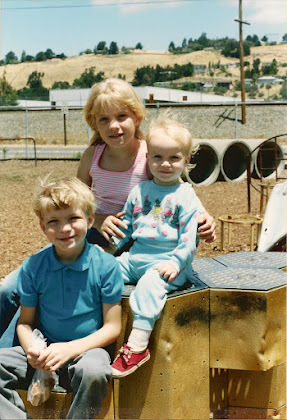 I was just a few years older than Michaela when she was kidnapped - I was living in Reno. I remember looking at her picture and not being able to comprehend how someone could steal a child. I really thought about Michaela a lot - I wondered if she was scared, if she was crying. I know I never knew her, but I just was so worried about her. Now I am a mother myself. 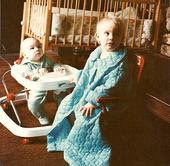 I have two beautiful boys with me, and my only daughter died in 1998. 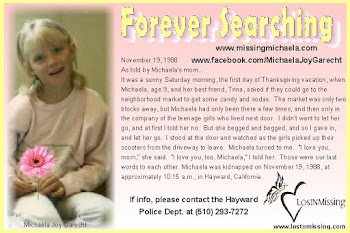 I found your facebook page from a grief group I am involved in, and immediately remembered Michaela and the kidnapping. But this time, I thought of you, and how you felt, and I wished for a moment that I could take away the pain for you. I found your blog, and started reading all the prior posts - the ups and downs. Again, you are just amazing. I don't know what I believe spiritually - I really don't. But, I can say that I hope you have some answers very soon. 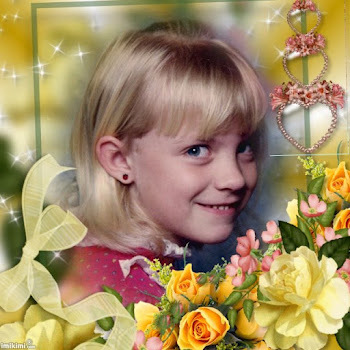 I hope that Michaela knows how much she is loved, and missed. I hope that somehow she can feel it - that there is some way she knows she has one of the most incredible mother's that has ever lived. I really am sorry this is so long and sappy - I didn't intend it to be. But I wanted you to know that people still remember her and are still looking. I think you and Michaela have touched more lives then you will ever know. (((hugs)) and you are both in my thoughts tonight. Heather, thank you, and I am so sorry for your loss. 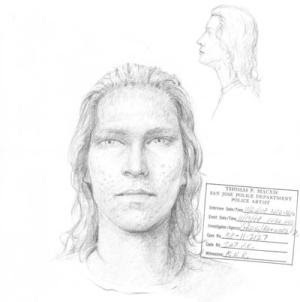 How did you lose your daughter, and how old was she? You don't have to say, of course. I just ask because I feel your grief but I want to feel its shape, but that is not something you need to share if you don't want to. I don't know what I believe either. But I do believe something. I believe that our existence is more than this brief physical visit to this lifetime. Not sure what. But something. My daughter, Gabriella, was almost a year old and she died when she slipped between her bed and the wall and couldn't breathe. I definitely understand feeling the shape of someone's grief - it helps a lot. I know the next four - six weeks are going to be tough - and I will hang a yellow ribbon on the 19th on my cube at work. I will continue to share her page and keep you and your family in my thoughts. I hope you know how many are here to lend you their hearts untill yours can be mended. Sharon, you said it perfectly: "I couldn't close my heart." It is good to keep searching, hoping, reflecting, loving. 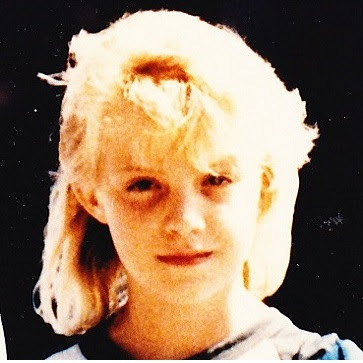 When I was processing my pain over my own childhood kidnapping, I reached out to you. You responded with kind words that gave me strength. 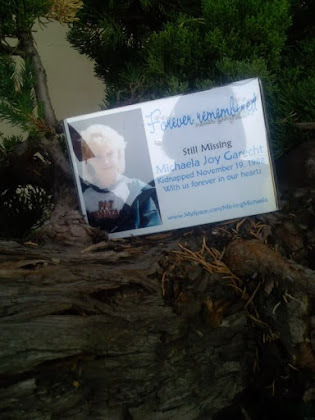 As I told you, I feel a strong connection to Michaela due to what happened to me. I think of her often. Sharon, my mother never looked for me or reported me missing. I was home soon enough, but the damage to my trust had been done. 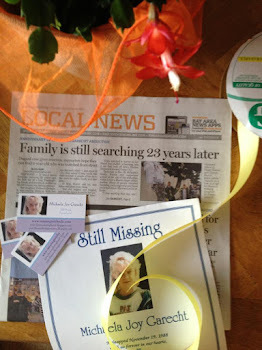 Sometimes I feel survivor's guilt and wonder why I made it back while Michaela is still missing. But mostly I find strength in your example of what a mother should be, and strength in Michaela so loved by so many. I have healed a lot, and am even starting the process of adopting a child! I have my heart set on a particular little girl, but she may no longer be available once I have finished the adoption approval process. But I am ready to be a mother like you, "with a heart that won't stay shut." Thank you Sharon, Michaela and the whole family. Mary, I wish you luck with your adoption. You've probably heard that saying that having a child is like walking around with your heart outside your body. But it's worth it. Let me know how it goes! Sharon, I truly feel your pain as another mother of a missing daughter. Michaela's circumstances are far different from Sarah's though because Sarah was 14 and we believe that she left on her own, then met with bad people along the way. Never-the-less, I just want to offer encouragement for you. I know there is probably no such thing as 'closure' even when they are found, but there may be peace for you in knowing she's with Jesus. Please stay strong and I will continue to keep you and your family in my prayers. Louise, thank you for writing, and big hugs to you! I wish for your baby to be returned to you soon, and may God bless you with peace. For everyone else, here is Sarah's story.